Put warm water in a bowl. Add yeast, sugar, salt, oil & milk. Mix well & rest it for 10min. In a mixing bowl put flour. Apply oil on top & close. Rest it for 25 min. Make it in to balls if dough sticks to hand too much apply oil on hand. Dip a kitchen towel or cloth in water & squeeze out the water. Cover the cloth on balls. Dust flour on the flat surface. Roll out the ball until you have a circle. Take it in a hand & toss it (one hand to other) N aan becomes big. Pull on one edge to get “Naan look” & place it on oven tray. Preheat the oven for 10min on 500F. 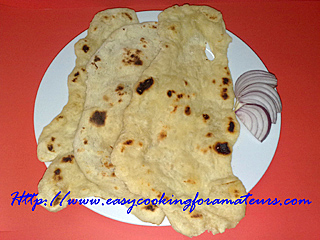 Bake Naan for 2min or till the Naan get lightly brown. Flip the Naan & bake other side. Remove from oven & brush it with butter. Note: If you don’t have oven no problem, you can also do it on griddle plate (tava) in high flame. Serve it hot with palak paneer, mashroom masala, butter chicken, list goes on. Yummy It goes well with any gravy. 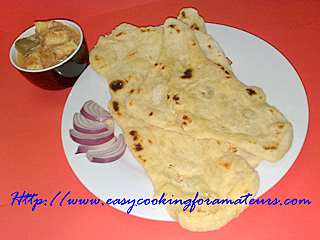 To try Buy “ready to eat Naan"
Your naan looks great! Our recipes are almost the same but I have never put yogurt in mine- what do you think the benefit is, I would love to know what you think. I will have to try it! Thanks for your comments.Using yogurt gives good flavour to a Naan. Those who are not willing to use yeast they can use 1cup of yogurt this will act as a raising agent.